Public space is an essential component of any great city. It brings people together to socialize, recreate, and work. More pointedly, it attracts people to the city, builds relationships, and spurs innovation and new ideas that fuel a city’s economic growth. How we optimize the investments made in our streetscapes, plazas, parks, and greenways is important to each individual project’s success and the city as a whole. Are the places being built fulfilling their promise? If so, could they be doing more and if not, how do they need to change? As budgets get tight and the competition for resources within a city’s budget increases, it becomes even more essential to answer these questions. We need to get the most out of our existing public spaces and when designing those in the future we need to make sure we build upon the successes and don’t repeat past mistakes. The post-occupancy evaluation (POE) is a useful tool designers use to understand how their designs have performed. They are a formal evaluation of a site that can involve a combination of observation, ad hoc monitoring, and/or user surveys. Because of the resources involved in performing a POE, more often than not these evaluations are made anecdotally when designers visit the space or as they address particular post-construction issues. This passive evaluation is much less rigorous than a POE and may not be documented or even happen at all. “Places in the Making”, a publication published in 2013 by MIT’s Department of Urban Studies and Planning, underscored this problem. They cited the lack of active metrics as a common challenge to placemaking efforts. They reported that “It is astonishing how few placemaking projects actively and honestly assess their own successes and failures.” They went on to explain the existing placemaking culture focuses on fuzzy, unmeasurable goals and that this has created “an inertia in assessment efforts”. The report stressed that this lack of assessment is detrimental to the field as a whole because valuable insights are left undiscovered and the same mistakes are made repeatedly. Both William H. Whyte’s seminal Street Life Project and resulting book and documentary, Social Life of Small Urban Spaces (1980), along with Jan Gehl’s extensive public life studies and influential book Life Between Buildings (1987) serve as the foundation of the urban design profession’s knowledge base. Their observations and insights were amassed through considerable time and manpower. We are lucky to have their contribution from which to draw upon when making future decisions. Though we shouldn’t stop observing and building upon their significant contributions. We must continually add clarity and resolution particularly in the unique and specific context of each place. Unfortunately, the POE and previous research are only snapshots in time. With the rise of embedded sensor infrastructure, “smart cities”, social networks, and ubiquity of smartphones that are becoming increasingly more powerful and sophisticated every year, the ability to gain real-time continuous 24/7 quantitative monitoring of public life data is now a reality. The ability to capture so much data is unprecedented and will only continue to get easier. The amount of and type of information that can and often is being collected about the world around us and ourselves is vast. When it comes to cities, transportation, parking, energy, waste collection, and water systems has attracted the most attention. In the private sector, retail analytics have been the focus. Collecting data for data sake should not be a goal. Rather we need be knowledgeable of what is available and possible while being discerning about the data that is useful for improving the management and design of public space. By selectively incorporating sensors into the design of physical space, the data collection system can provide real-time information about the use of the space. Like website analytic systems, the network can provide useful information about the number of people using the space, how long they are using it, as well well as other meaningful measures of public life. The data gathered can be combined with a wide array of environmental data such as temperature, humidity, sun/shade patterns, rain fall, water quality, and air quality. In addition, other available data sets such as sales tax collections, building permits, real estate transactions, and programming/event schedules can be overlaid with data to make relationships between the use of the public space and its context more visible. While the real-time nature of the data can be used to quickly understand the immediate impact that programming and design decisions have on the space and vice versa, it can also capture data and trends over extended durations that would not otherwise be possible without considerable resources. All of this enables us to make more informed decisions rather than anecdotal observations and assumptions. With the interest of tactical urbanism and other short-term public space investments, this need for data is greater than ever. The data can be used to justify investment in long-term improvements and/or make slight adjustments in temporary spaces to increase their effectiveness. In our data driven society, it is not only becoming increasingly necessary to provide real data around the metrics that matter to decision makers. It is also is critical that the data gathered is open and in a digestible, and understandable format that makes it easy to act upon. Initiatives like City Dashboard that aggregates real-time data within the UK about a particular city and Jonas Lund’s Gallery Analytics at the ReWire Festival mentioned in previous post are a good start and are harbingers of the coming future. 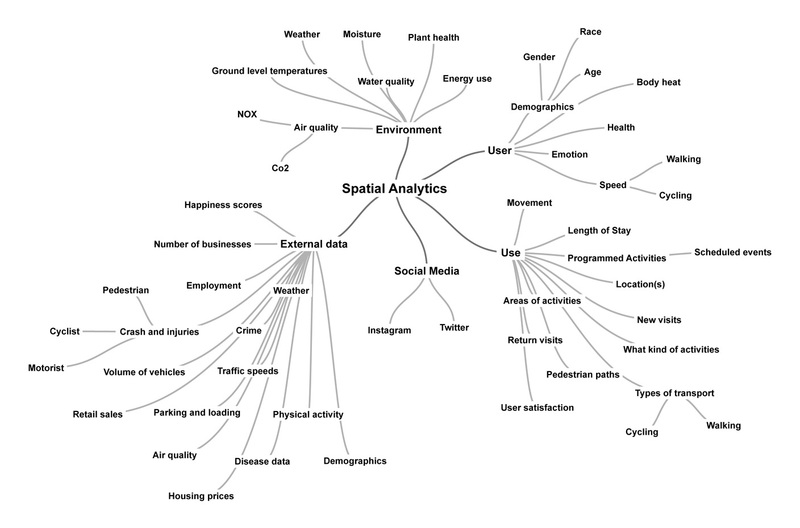 Those who design and manage the space around us will increasingly grapple with these new technologies and data streams as they seek to understand how to integrate the means of collecting the data as well as the use of the data. As we speed toward the future where we can can monitor and collect data on nearly every dimension of public space, we must ask ourselves what do we want to know and why?, what is just noise?, what is appropriate to collect? This entry was posted in Public Space Metrics, Smart Cities and tagged analysis, Internet of Things, Jan Gehl., Metrics, placemaking, Public Space, William H. Whyte. Bookmark the permalink. Can you provide citations for the top two images in the post, i.e. 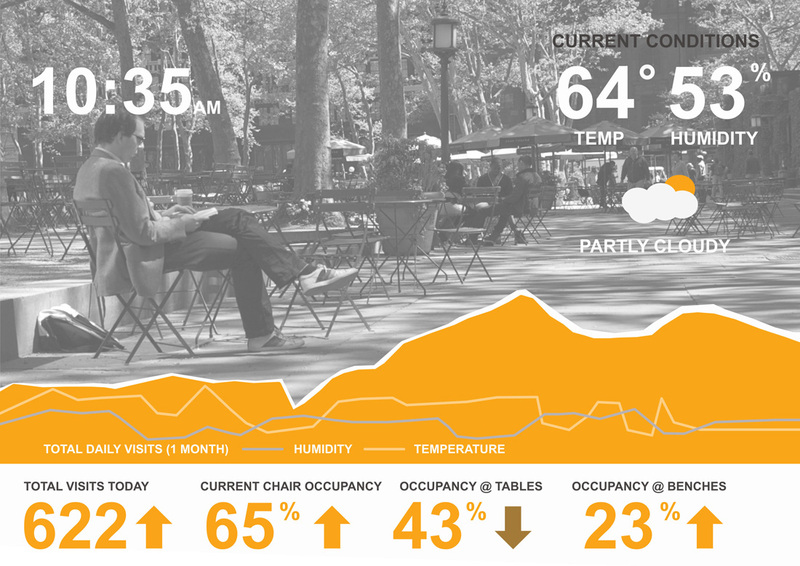 the metrics of public space use at what appears to be Bryant Park? 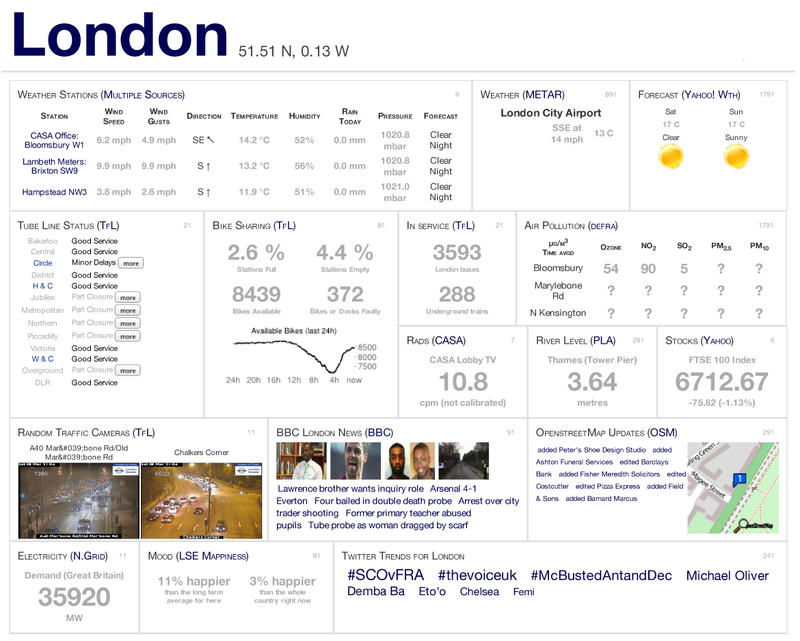 It was created specifically for the blog post to represent the concept of a public space analytics dashboard.